School of Medicine, University of Western Sydney by Lyons. Courtesy: University of Western Sydney. Universities and healthcare institutions provide the backbone for many cities, informing urban design and the lifestyle of citizens. Paul Walter considers the recent developments and plans for Parramatta that are providing the building blocks for transformation. University education and student life is changing. Living on or near campus in a cheap run-down terrace house, surviving on sandwiches and falafels, days on end in the library, all these are things of the past. Today students produce their final assessments while juggling a thousand other things they need to do. They rush from work to home to a lecture – doing this without a car in Sydney is very difficult; in Western Sydney it is virtually impossible. Connectivity and location have become all-important to universities. Campus planning and development approaches have also shifted significantly. In the 1990s and 2000s the thinking was around town and gown: should we build a town environment in the university campus? Should universities open campuses in town centres? There are now seven major universities present in the Sydney CBD (not counting the University of Technology, Sydney [UTS]). Newcastle University is about to start construction on its eight-storey building at Civic and the University of New England has a presence in a sandstone building on Church Street in Parramatta. As universities redefine the way they operate, they distinctly shape their context. Recently, there has been a lot said about anchor institutions and about eds and meds (education and healthcare) as valuable cluster-creating forces. Parramatta is in a position of having both: the internationally significant health precinct at Westmead to the west, University of Western Sydney (UWS) in Rydalmere lies to the east. However the physical links to these are awkward, Parramatta parklands separate the CBD from Westmead and the eastward connection is only along the heavy traffic corridor of Victoria Road. This missing east-west link explains why the light rail link is such an important priority. UWS might be the most strategic anchor institution in Sydney. It covers a territory more extensive than all of Sydney’s other university campuses combined. Established at the tail end of the Hawke era as a conglomeration of College of Advanced Education (CAE), it has grown to join the ranks of the world’s top two per cent of universities, all without the endowments from alumni that benefit the older universities. There is a set of contrary forces at work in our universities. The trend towards online learning had some people saying that our universities would go the way of print media: less significant in the material world but more in the virtual. However, it is a characteristic of anchor institutions that their direct impact through land holding, large capacity for employment and cluster for economic development tend to make them spatially fixed. 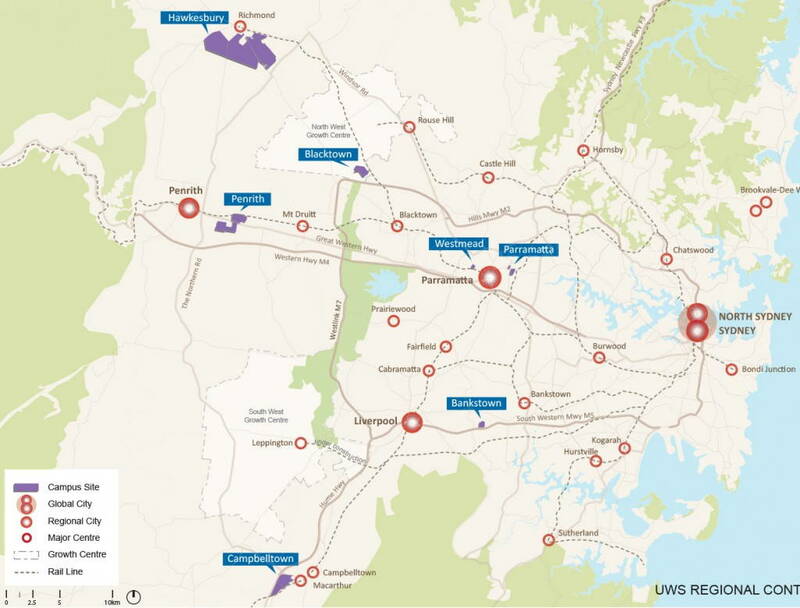 UWS is situated at the key nodes identified in the metropolitan strategy A Plan for Growing Sydney (the Plan). Besides Parramatta, its new Werrington Corporate Park at the Penrith campus sits at the intersection of the north-south and east-west corridors. The Hawkesbury and Campbelltown campuses anchor the north-west and south-west corners of the Plan. UWS has also been activating its campuses. At its state heritage significant Parramatta Campus, UWS has built about 23,000m2 of new teaching space in two buildings (Hassell) and created a new student hub with the Boiler House Project (Tanner Kibble Denton Architects). At its Campbelltown campus, UWS established the School of Medicine (Lyons). This is the first new medical school in New South Wales for more than 30 years. The presence of this medical school directly influences the emerging cluster of health services in the South West. Surgeons and specialists travel between Campbelltown and Liverpool hospitals, with the opportunity to teach or engage with the new medical faculty being an attractive prospect. Importantly, private capital responds to this: currently private equity is funding a hospital and health precinct at Gregory Hills (near Oran Park), so private capital is responding to public investment in teaching. UWS at Parramatta has been confronted with the very question of town versus gown. Should investment flow into Parramatta CBD or the Rydalmere campus? With ongoing investments in Rydalmere and the decision to make a large commitment to Parramatta Square, the university is investing in both. UWS’ presence in the CBD will be part of the Parramatta Square redevelopment, one of Australia’s largest renewal projects. The flagship vertical campus will become home to over 10,000 students and will include new learning environments that promote greater flexibility and collaboration. The new facility, to be built and owned by Charter Hall, totals 26,000 square metres over 14 storeys. UWS will initially use approximately 20,000 square metres with the remaining floor space an option for expansion as the university grows over the next decade. The Rydalmere campus has a traditional campus feel. It was formerly an orphanage then an asylum, before it became a university campus in 1998. The potential of this site is somewhat limited because of its great heritage significance: the riverfront Female Orphan School building is the oldest surviving three-storey brick asylum building in Australia (the asylum era buildings are mostly one storey buildings). The site has river-frontage to the south and is cut-off by the motorway-like James Ruse Drive to the west. However, the surroundings of the campus are distinctly low-intensity; the advent of light rail could be their catalyst. Sydney has long struggled to establish a really convincing secondary node. The land-value contours are distinctly concentric around Sydney and the transport corridors have always taken a strong single asterisk formation. For decades transport planning has made much of the geographic centrality of Parramatta and planned its nodal role, however during the previous state government term the only major transport corridors (northwest and southwest heavy rail) reinforced Sydney’s primacy. There is real change in Parramatta: commercial office space value is higher than North Sydney, a string of public domain projects are changing the feel of the place and for the first time the street life is getting an urban vibe. In July, Parramatta city’s CEO Greg Dyer named the three most transformational projects for the city: Parramatta Square, the light rail and the UWS CBD project. It is becoming possible to imagine a student, studying, working, even living without a car. It seems that together, UWS and Parramatta City Council are determined to join town and gown in a city between the eds and meds. Map of University of Western Sydney campuses and hospitals. Courtesy: University of Western Sydney.